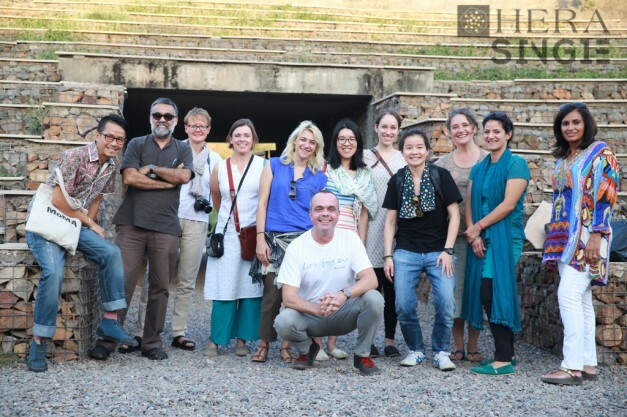 As part of the HERA SINGLE Delhi workshop, the team took a fieldwork trip with Prof. Sanjay Srivastava to Gurgaon a satellite city 30 km away from the capital, and in particular visited three sites: Fortis Memorial Research Institute; Cyber Hub; Aravali Bio-Diversity Park. 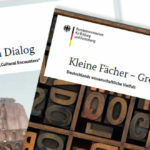 The essay engages critically with these spaces in order to investigate the broader project underlying the development of the town. As part of the HERA SINGLE Delhi workshop, the team took a fieldwork trip with Prof. Sanjay Srivastava to Gurgaon, a satellite city 30 km away from the capital, and in particular visited three sites: Fortis Memorial Research Institute, Cyber Hub, and Aravali Bio-Diversity Park. 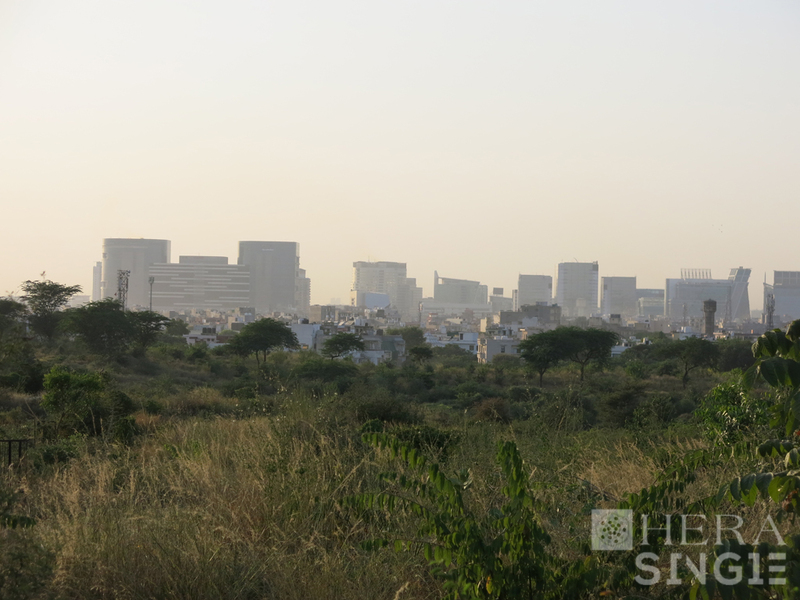 Gurgaon had a construction boom at the hands of DLF corporation from the beginning of the 1980s. The city has grown enormously in the past twenty years, transforming a rural, village area into a satellite of Delhi, competing with the metropolis in terms of office spaces and residential enclaves for a growing urban population. The town’s initial development was fast forwarded by the arrival of the call-centre industry, whose immense offices required cheap land to be built on, a luxury no longer available in Delhi. As corporations as Deloitte, Nestlè, or Maruti placed their headquarters in Delhi, Gurgaon’s population grew in numbers and economically, and new exclusive spaces appeared that would appeal to middle-class and upper middle-class tastes. Fortis Memorial Research Institute is a privately owned 5-star, referral hospital that provides full-range, advanced medical care. Placed in front of IFFCO metro station, in a new, fancy building, it can host up to 1000 patients with a special wing dedicated exclusively to non-Indian nationals. Medical tourism is a growing business in India, with people from all over South East Asia and the Middle East seeking high-end health care services, and the hospital strives to become a “Mecca of Healthcare for Asia Pacific and beyond” (from the Hospital’s website). The hospital is designed and maintained to convey an idea of hygiene and efficiency, but also luxury and comfort. With a food hall, a cinema showing both Hindi and American movies, a TV room with reclining, massage chairs and a sophisticated system of internal communication, Fortis Memorial promotes itself as a cosmopolitan, modern, efficient space, easily juxtaposed to Delhi’s overcrowded governmental hospitals. Health care, here fully privatized, is thus transformed into a commodity, and the hospital into a mall-like environment, in which health care itself is consumed, its access based on income and social status. 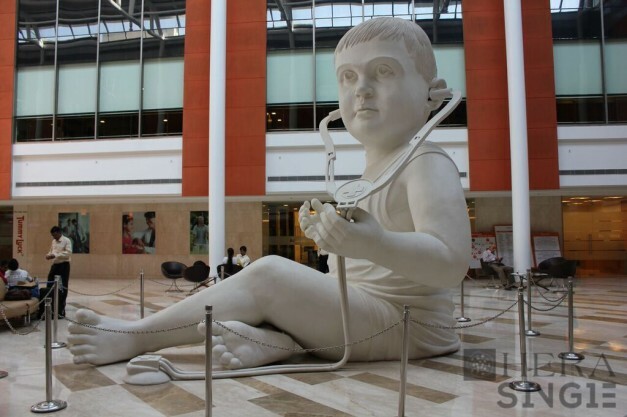 A gigantic marble statue of a baby with a stethoscope towers in the hall, attracting the curiosity of visitors and patients who take selfies and pose with it. It is a grand representation of what the institution stands for: growth, science, family, individual development. It places the hospital at that thin and negotiated conjuncture between what are often read as imported values and traditional Indian morals (for an in depth discussion of this, please refer for instance to Srivastava, 2012). 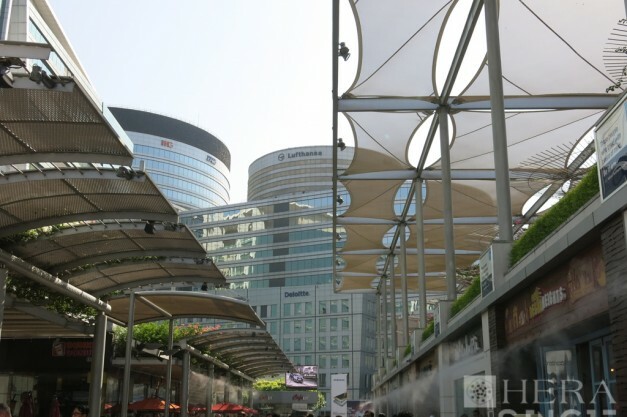 Gurgaon’s most famous space is without a doubt Cyber Hub, a pedestrian-only, open air, mall-like area with bars, restaurants, cafes, arcades, cinemas, most of them part of big international chains like Starbucks, or local ventures as Big Wong or Oh Calcutta! It evolved around the high-rise headquarters of multinationals, as a recreational space for the white collar workers and the growing middle-class population of a wealthy city. 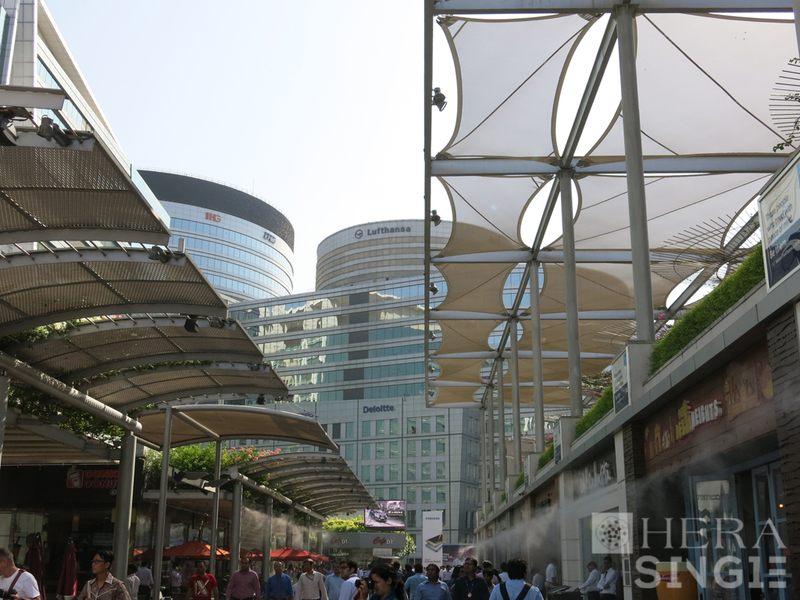 In its outlook, Cyber Hub takes inspiration from metropolitan centres like downtown Los Angeles or Singapore, but access to it is filtered by guards and metal detectors at the entrance gates. Masking itself as a public space where anyone can safely stroll around, it is instead highly controlled and monitored, with CCTV cameras (more than 12000), secured walkways, and a 8ft high boundary wall. At the same time, it projects itself as eco- and family- friendly, using natural gas, on-top solar panels and a zero emissions policy. 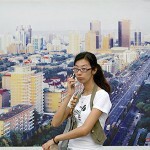 These two aspects combined produce a space that appeals to the middle-class through guilt-free consumerism. 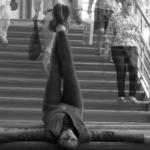 Social inequality disappears beyond the boundary gate, as lower strata of the society are denied access, whilst simultaneously the ecological aspect – that has becoming so pressing nowadays – counterbalances the experience of consuming with a sense of decency and validation for taking part to activities that do not pollute. The lack of cars within Cyber Hub builds up to this idea of making city space clean. Aravali Bio-Diversity Park is a conservation area of 600-acre that only seven years ago had been exhausted and rendered barren by mining. A corporation-funded NGO, I Love Gurgaon, took up the challenge of transforming into what is today a park with a 4 km cycle track, a 3.5 km joggers track, a sanctuary for a variety of birds (120 species), and 46,000 plants. Two large nurseries host new kinds of plants or young specimen that require special attention before being planted outside. A large, 400-seat amphitheatre hosts events and plays. Transforming the barren land into a conservation area was Latika Thukral‘s idea, a former banker who believed Gurgaon lacked green spaces that the citizens could enjoy. She pitched the idea to her former employers and other corporations she had dealt with during her career and managed to secure a multi-core funding. The target population is, once again, a growing middle-class that is craving a sense of space, variety of entertainment, and a healthier lifestyle in a city (and here I am referring to the larger NCR area, which includes Delhi) that is becoming increasingly crowded and whose levels of pollution are the highest in the world. In conclusion, rather than pursuing inclusive policies, Gurgaon’s authorities and developers are transforming it to accommodate a particular strata of the population and its aspirations and expectations about city life. A city of gated communities might turn soon enough into a gated city.